Streamlined manufacturing processes that leverage Design for Manufacturability (DfM) and scientific molding practices to maximize consolidation opportunities that, in turn, optimize supply chains and speed time to market — leading to sustained competitive advantage and profitability. Improved end user functionality, as seen in defense applications where single-piece, injection molded protective gear and select devices gives troops added agility and better performance in the field. Cost savings presented by parts consolidation can be substantial because it helps eliminates additional tooling, expensive secondary operations like welding and time-consuming assemblies. 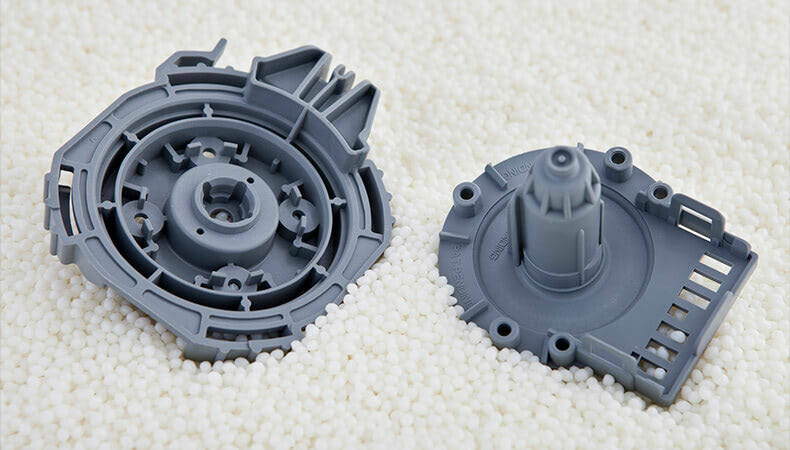 Further, a single injection molded plastic part can be a suitable and more budget-friendly substitute for multiple metal components because plastic molding can accommodate more complex geometries than die cast metal. A medical OEM was faced with producing a series of complex medical device components that required multiple tools and dozens of screws and pins for assembly. Converting the components to a single injection molded version accomplished a number of cost-saving measures, most notably that multiple tools were reduced to one, and assembly time was eliminated altogether. As a result, production time was slashed from 15 minutes to under one and part costs dropped by up to 80%. Major automakers are encountering tightening regulations around fuel efficiency, making lightweighting vehicles a primary goal. In addition to trimming weight by combining parts where appropriate, injection molding played a major role in metal-to-plastic conversion for two heavy hitters in the auto industry. The first OEM was able to switch an assist step on a SUV from metal to plastic, reducing weight by 51% while gaining enhanced part performance. The second OEM replaced a steel-and-plastic front end bolster with an all-in-one injected molded version which trimmed part weight by 46%, improved storage and handling protocols and drove down the emission of greenhouse gases on this particular vehicle model by the equivalent of 770,000 gallons of gasoline. A hand tool manufacturer converted a drill housing from a high piece count process to a single injection molded unit that addressed the multi-use end user functionality of the tool body: handle, battery receptacle and motor guard. In addition, by using an injection molding solution, the OEM was able to include overmolding in their high volume runs to improve grip, feel and aesthetics. An OEM in the paper industry undertook a redesign of a roll shaft hanger in a large format printer. A total of six hangers were required in each print, translating to 42 separate manufactured parts for this one component. Engineers reworked the design entirely and a single-piece injection molded hanger ultimately replaced its predecessor. The enhanced resins used proved tougher and wore better than the original, and snap-in bearings replaced cumbersome and costly fasteners. Over the life of the printer, this parts consolidation cost less than the original assembly. Working with an experienced molder to convert your expensive and inefficient parts to fewer complex injection molded components is a smart business decision with wide ranging benefits, including the ability to take advantage of certain metal-to-plastic conversion opportunities. To learn more, read Metal-to-Plastic Conversion is the Wave of the Future. Click the button below to access your copy now!